Dream it Do it EA Safaris offers travellers the opportunity to explore the diverse beauty of East Africa. Our team is professional, dedicated and exceptional at what they do, from the office staff that you will never see, to the drivers, tour guides and local experts will make your trip unforgettable and are the cream of the crop. We ensure our clients get the best value for money. We do not include any hidden charges or fees. Simply put, the prices we quote for itineraries is final. 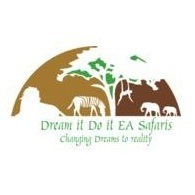 Dream it Do it EA Safaris customizes your trip so that you do not pay for services you are not interested in receiving. We understand that one size does not fit all. We give you a safari of a lifetime, on your terms. The top priority is your safety and comfort throughout your entire journey. Our leaders have all been thoroughly trained in travel safety and are highly experienced in running trips. You are personally involved in tailoring your trip in coordination with our tour expert staff and tour leaders. We can help you choose an appropriate trip and form an itinerary that meets your personal interests and style. We will always return your inquiries in a timely fashion and we can respond to any phone calls if you require further guidance. Our clients have often remarked that the friendships formed with our guides along the trails have been among the most meaningful experiences they have had throughout their journey. Let us help you craft the trip of a lifetime with the places and sights that you would like to see and avoid the ‘standardized tour’ experience.